I'm finally Instagramming some of my Rocks & Fortresses adventures: tracking invisible empires along the Mediterranean. #rocks #fortresses and things that happen along the way. From 14 to 26 October I will be artist in residence at Darat al Funun, Amman, Jordan, undertaking research for an exhibition and participatory events to be held there in collaboration with my collaborator artist Eva Sajovic in March-April 2017. Elephant & Castle doesn’t exist as a political ward, yet it takes shape in the imaginations of people who live and work in the area. Artists Corinne Silva + Eva Sajovic invite LCC students, staff and members of the community to join them for a participatory walk, led by Revd. Dr. Peter Stevenson, the minister of Crossway United Reformed Church. Peter will show us his personal boundaries of the Elephant & Castle, and share the story of the church’s one hundred year engagement with local people. Beating the Bounds is part of London College of Communication's public programme. Earth collected from each location I make a photograph in will be ground into paint pigment. I am the featured photographer on Firecracker, the online platform dedicated to supporting women photographers. Elephant & Castle doesn’t exist as a political ward, yet it exists in the imagination of people who live and work in the area. Artists Corinne Silva + Eva Sajovic invite students and members of the community to join them for a participatory walk, led by Danny Hollowell, who will show us his personal boundaries of the Elephant & Castle. Beating the Bounds is an ancient English custom in which a priest and members of the community, armed with willow boughs, would beat the parish boundary markers, lest they be forgotten. Walks will be digitally traced using an app. The artists will then superimpose the resulting drawings to identify a collective boundary of the area and produce a multi-media map. Join artists Melanie King, Corinne Silva, Eva Sajvoic and Alice Cazenave in a workshop to create a massive cyanotype print using sunlight, plant debris and salvaged flowers from New Covent Garden Market. 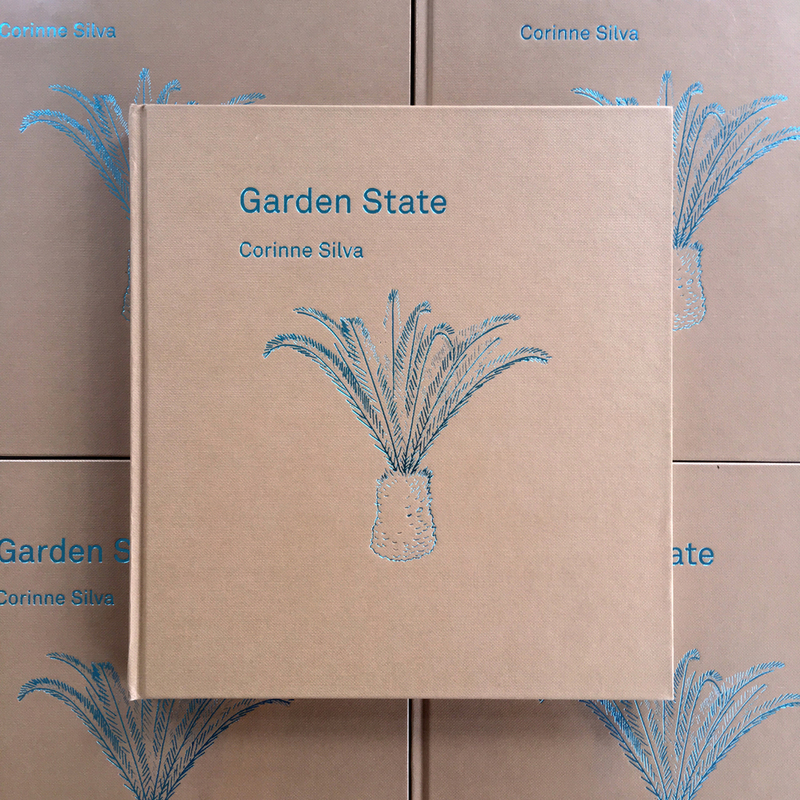 I'll be signing copies of my new publication Garden State at Photo London in the Rizzoli bookshop, Somerset House, Saturday 21 May 2016 from 4pm. Friday, 15 April 2016, 2-3pm, led by artist Rebecca Davies. Elephant & Castle doesn’t exist as a political ward, yet it exists in the imagination of people who live and work in the area. Artists Corinne Silva + Eva Sajovic invite students and members of the community to join them for a participatory walk, led by artist Rebecca Davies who will show us her personal boundaries of the Elephant & Castle. The walk is part of TCCE programme of walks. I'll be showing Imported Landscapes as part of reGeneration 3 at FORMAT International Photography Festival, Derby, UK, from 26 March to 12 June 2015. Corinne Silva and Eva Sajovic will perform Eating the Bones within their installation Five Hundred Flowers and the Mother Plant at UAL/LCC's Lower Gallery installation as part of the WILD: ReNaturing the City symposium. The performance embodies a number of voices including memories of individuals collected during workshops held by Silva + Sajovic with the People’s Bureau at Tate Britain (October 2015). 2-3pm, led by Alison Proctor of Siobhan Davies Dance. Elephant & Castle doesn’t exist as a political ward, yet it exists in the imagination of people who live and work in the area. Artists Corinne Silva + Eva Sajovic invite students and members of the community to join them for a participatory walk, led by Alison Proctor of Siobhan Davies Dance who will show us her personal boundaries of the Elephant & Castle. The work is presented across two spaces: in the Lower Gallery an evolving installation of objects and plants begins with a poster of plant nursery owner Mr Lancner, amongst the flora he cultivates for profit. The artists extend this image into the physical space of the gallery by installing rows of trays containing mass-produced geraniums, now in various states of growth and decay, bought by the artists from Europe’s biggest plant nursery Syngenta. A vitrine of bones and performance-for-video Counting (2016) further explore life/death cycles and, in the latter, the artists’ capacity to nurture the thousand plants they originally purchased. These works are juxtaposed with a tiled poster of the Mother Plant. This geranium was inherited from Silva’s Grandmother Janet, who cultivated and shared the plants known in the family as The Red Jan Line. Audiences are invited to take away sections of the grid. In the PARCspace the artists present research materials and documentation from this exhibition and their collaborative work to date. Here the artists consider how their inquiries have been explored – and complicated – through the different strands of their practice. Oluwale Now brings together those whose garden, art and literary work has collectively acted to remember Oluwale. Speakers include Kasia Boddy, George McKay, Corinne Silva, Caryl Phillips and Gary Younge. With itinerant artist network *TSOEG including Ignacio Acosta, Luce Choules, Andrew Ranville, Corinne Silva, and Emma Smith, and keynote speaker Dr Harriet Hawkins, Royal Holloway University of London. This symposium will consider the wider role of fieldwork in contemporary arts practice, including themes of exploration in Julian Charriere's work. A panel of artists will share insights into their research, personal fieldwork methodologies, and artist-led expeditions. A discussion will be opened up to examine artistic practice in the landscape, reflecting on the ways artists are redefining the geographic narratives of place, site and encounter. *TSOEG - Temporal School of Experimental Geography is an itinerant network of artists sharing ideas and responses to landscape through fieldwork. The aim of TSOEG is to bring together artists working across a range of disciplines and geographic environments, to discuss fieldwork as methodology, parallel activity, art form, and research. Artists: Luce Choules, Andrew Ranville, Corinne Silva, Ignacio Acosta with Jakub Bojczuk, and TSOEG guest artist Tuur Van Balen. Before inviting questions from the audience, the panel will showcase various expeditions and/or fieldwork relating to recent work in a diverse range of geographical locations: French Alps, USA, Middle East, Poland/Chile, and Democratic Republic of Congo. Corinne Silva + Eva Sajovic, as part of In/Visible Cities - London, with Keith Piper, Dubmorphology, Ines Von Bonhorst, Yuri Pirondi and Fatima Bianchi, 198 Contemporary Arts and Learning. 13 November to 19 December 2015. Closing party 18th December, 7pm till late, Eating the Bones performance 8pm. Silva+Sajovic's installation opens with one thousand red geranium plug plants bought from an industrial plant nursery in Holland and a number of geraniums from the Red Jan Line. The installation, which will evolve over the coming months as it moves to different spaces in London provides the context to explore methods for disrupting prevalent human/plant hierarchies. In the Spring the artists will begin to hybridise the Red Jan Line with the nursery plants. Commissioned by The Poetry Society and Filmpoem to produce a short film in response to Jonathan Tel's award winning poem Ber Lin. National Poetry Competition 2014 - Commended: Jonathan Tel for the poem Ber Lin; accompanying film directed by Corinne Silva, read by Alastair Cook and with sound by Vladimir Kruytchev.